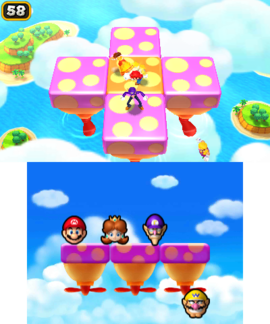 Fisticlouds (known as Shuffle Scuffle in PAL regions) is a General minigame which can be played in Mario Party: Island Tour. The name is a portmanteau of "fisticuffs", a boxing style, and "cloud", due to its sky setting. It plays near-identically to Lava Tile Isle from Mario Party 2. Each player is standing on a pink platform. These platforms move, and players do a combat pose. The participants are on a set of platforms floating in the sky. There is an orange, stationary platform in the middle, and four pink ones around it, which can move. The platforms will occasionally rotate as well. The objective here is to be the last one standing by pushing the others off the stage. Rules – "Bonk your opponents over the edge. Last player standing wins." This page was last edited on August 28, 2018, at 17:47.